Elon Musk may have put a red roadster into space, but today Forecast 5 announces the launch of One Touch Reporting. Allowing users to print all the main reports from their forecast at the press of a button, OTR is a significant addition to Forecast 5’s growing and impressive array of functionality. One Touch Reporting employs pre-formatted templates to hold the key reports – Balance Sheet, Profit and Loss Account, Cashflow and FundsFlow Statements together with a Fixed Asset Report, and allows users to develop and print in addition Cover Pages, Contents Pages, Disclaimer, Contact Pages, Schedules of Assumptions and any other free formatted pages the user may wish to include. 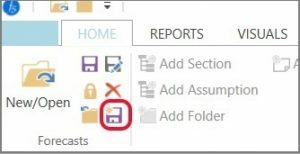 And then having amended the forecast because the client wants an interest rate changed – run off a fresh set of reports, without having to do any re-formatting! A simple OTR Step-by-Step Guide is found here, a OTR video guide is here and the full Release Notes are here. The trigger for OTR is found in the Budget Reports section of Forecast 5. When you open Forecast 5, you will be alerted that a new version is available and directed to the download page. Download the relevant version to your PC and run the installer over your current version. If you do not have this message, follow the instructions below. If you are a Network user, you MUST upgrade all PCs at the same time to avoid corruption. Forecast 5 users frequently backup their forecast files (in *.xml format) by hitting the little Export Forecast icon – as shown here – or on the “Open Forecast” screen, where this button is grouped just above the Import button at the foot of the screen. But what do you do if you want to backup not just the current forecast, but the entire database that contains all your forecasts? Forecast 5 uses Microsoft’s SQL Server database system to store its data, and is shipped with SQLLocalDatabase. Many users find it useful to upgrade this to SQLExpress, both of these editions being free from Microsoft, or even to the commercial version, the full SQL Server. Whichever version of SQL being used, the simplest way to backup the database and all the forecasts stored thereon is to use the tool provided by Microsoft for just for this job, SQL Server Management Studio (“SSMS”). A PowerPoint demonstrating the installation and use of SSMS to backup your database can be downloaded from our website, here. Hat tip to Craig, our new IT Consultant, who suggested this is an important aspect to highlight. Free Introductory webinar – Thursday 1 March – This webinar is a perfect way to get an overview of the functionality of Forecast 5, especially if you are low on time, not sure where to start with the trial or want a little bit more information. The Webinar will take an hour. Register today to reserve your space, here. Essentials Training Course – Wednesday 28 February – The Essentials course is designed as comprehensive training for all users of Forecast 5. Attendees will gain extensive knowledge into the workings of Forecast 5, such as setting up forecasts, entering actuals and opening balances, viewing reports and changing record types to match their data. You will also learn about What If scenarios. After completing this course, the attendee will have gained a deeper understanding of Forecast 5. To register, please book here. Advanced Training Course – Friday 2 March – The Advanced course is designed as a comprehensive in-depth training for all users of Forecast 5. Attendees will gain extensive knowledge into the advanced workings of Forecast 5, such as stock, wages and consolidations. After completing this course, the attendee will have gained a sound understanding of Forecast 5. To register, please book here. The Introductory webinar is free, whilst there is a 10% early bird discount available on the tickets for both the Essentials and the Advanced Training course with a 20% discount for two or more who book from the same organisation. 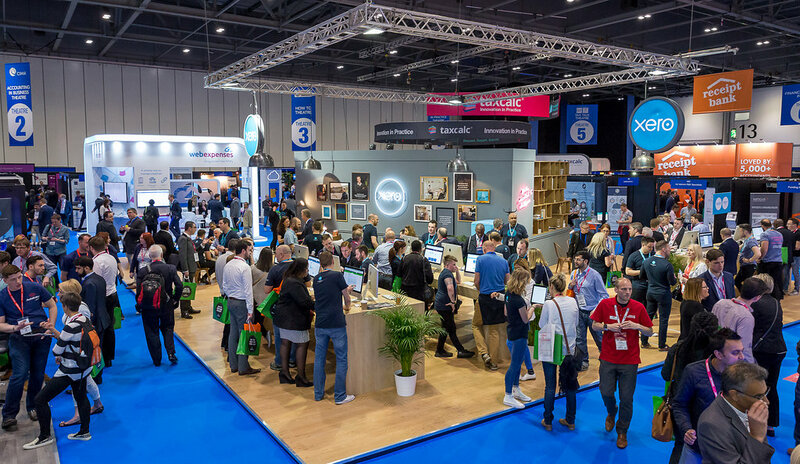 Accountex 2018 will again take place this year at Excel in the Docklands and as in the last two years, Forecast 5 will be exhibiting. Geof Nightingale, the CEO of Forecast5 Limited will be over from New Zealand and surely, as in the past, we will be demonstrating Forecast 5 non-stop from 10am through until the organisers drum visitors out the door. You are all welcome to visit us; please diarise the date (23 & 24 May) and we look forward to meeting you. Admission is FREE to pre-registered visitors. Those who have not pre-registered online by 5pm on Tuesday 22 May will be charged an entry fee of £25, online or on the door. So get on over to this page to book your free tickets. In line with the incoming GDPR, readers are assured that each newsletter circulation from us comes with an “unsubscribe” button on the bottom of the email. 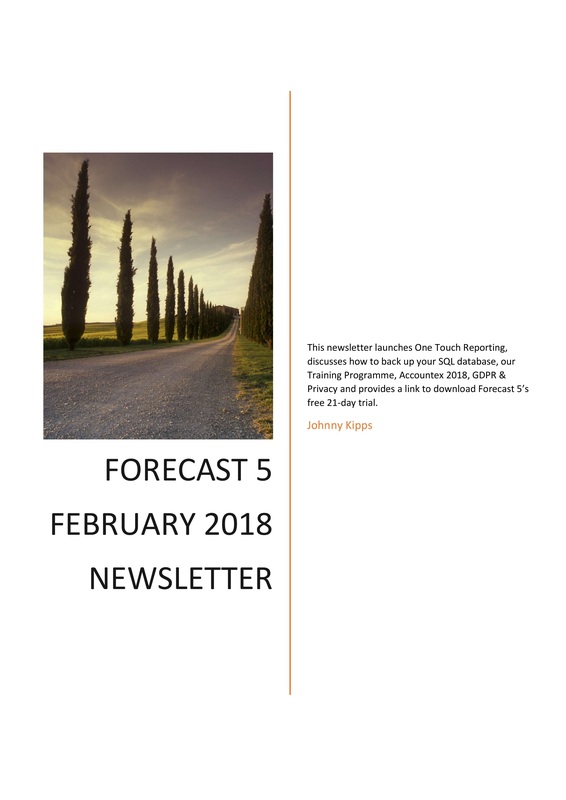 If you are not interested in forecasting as a general subject or Forecast 5 in particular, please do feel free to unsubscribe yourself; we have no desire to communicate with anybody who has no interest in this subject. 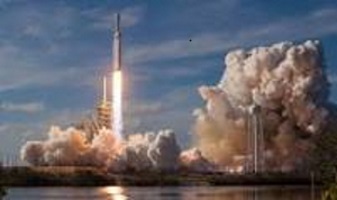 Download a Free Trial If you would like to take Forecast 5 for a test drive to experience the power of this great forecasting software first hand, please feel free to download your free 21-day trial version from this page.